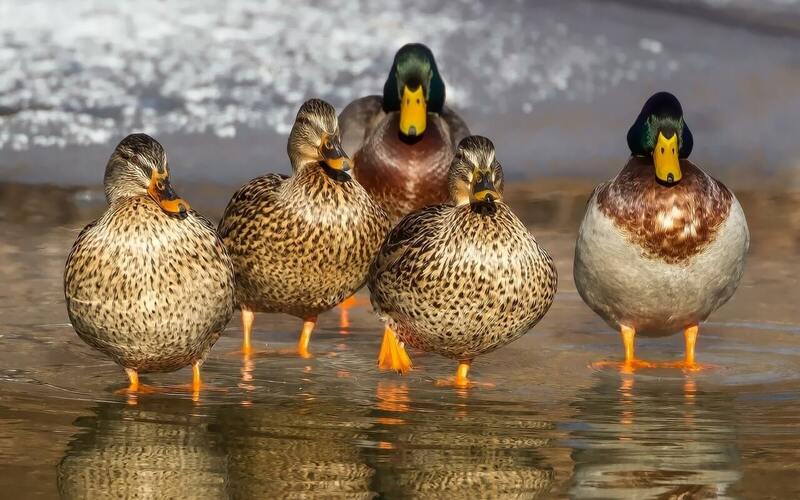 We've heard all kinds of crazy lottery stories before, but a group of ducks winning the lotto? Never! 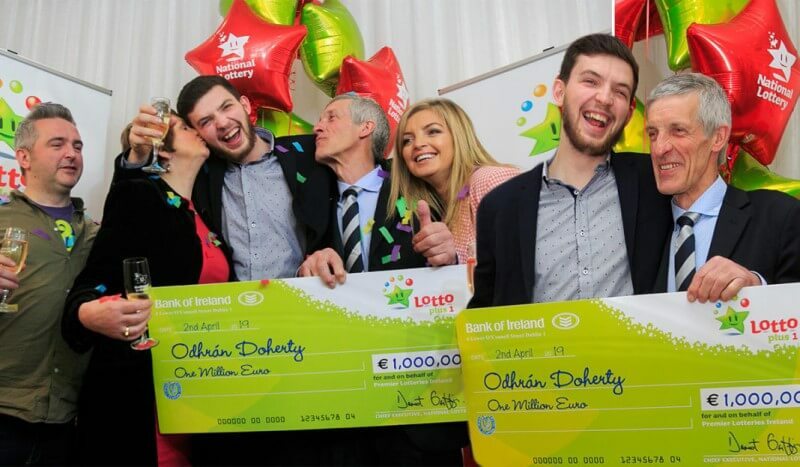 That's exactly what happened in Dungarvan, Co. Waterford, Ireland, though, when a syndicate of 22 pharmaceutical workers, aptly named Two Little Ducks, bagged themselves a €500,000 EuroMillions Prize! We know of lotto syndicates that have struck it rich before (in fact statistics show that one in every four jackpots is won by a syndicate) but never one this big! Made up of 22 members from the GlaxoSmithKline pharmaceutical company in Dungarvan, the Two Little Ducks syndicate includes members aged from 25 to their mid-50s, all working in a variety of departments throughout the company - one that has been in Dungarvan for 28 years, and is very much a part of the community landscape. Having a syndicate of 22 members may be somewhat unusual, but then that's par for the course for this lucky group. One only has to look at their jackpot winning record, which includes not one, but two lotto wins in the same week! With a rule to only play EuroMillions jackpots of a certain size (i.e. 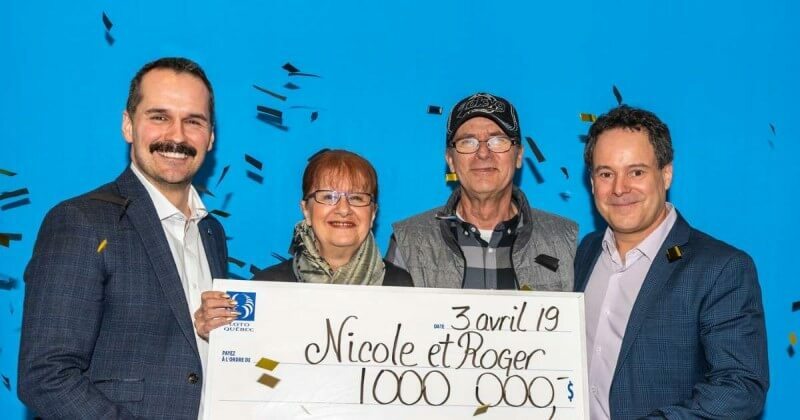 big), the group purchased their first winning ticket into the draw on 3 March - one with an appropriately massive rollover jackpot of a guaranteed €100 million. After making their first bid for jackpot glory on the Tuesday, the group were stunned to find they had matched four numbers for a prize of €2,000. 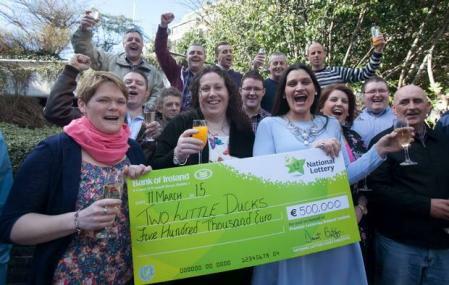 Not to be outdone, Two Little Ducks put themselves back in the lotto-winning game when they bought another ticket for the Friday night draw - only to discover afterwards that they had matched all five numbers in the EuroMillions Plus draw and netted the top prize of €500,000! Divide that by 22, and you get an even split of €22,727.27, which is what each member will be taking home with them - not bad for an initial investment of €15 shared 22 ways! Lotto syndicates are hugely popular amongst work colleagues and friends, with the combination of shared expenses and shared excitement being an irresistible attraction. 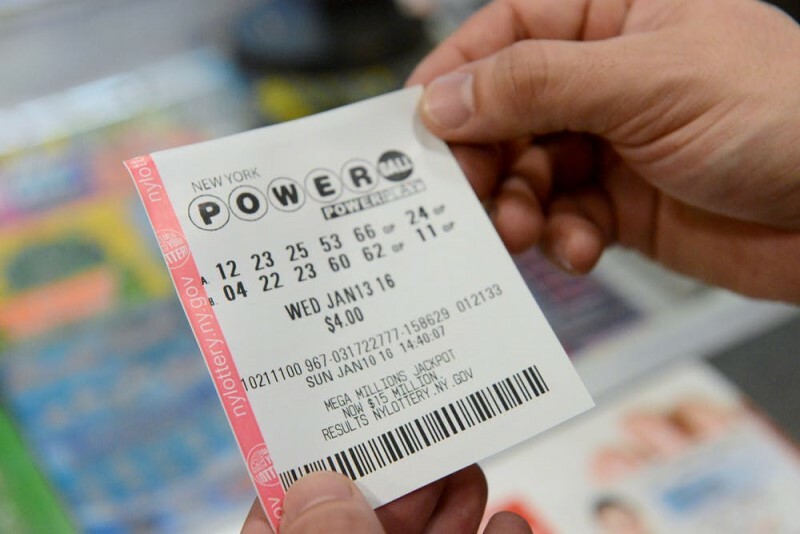 Buying a ticket with a group of lotto fans not only helps you share the cost of a ticket, but allows you to buy more at the same time, thus increasing your chances of winning. 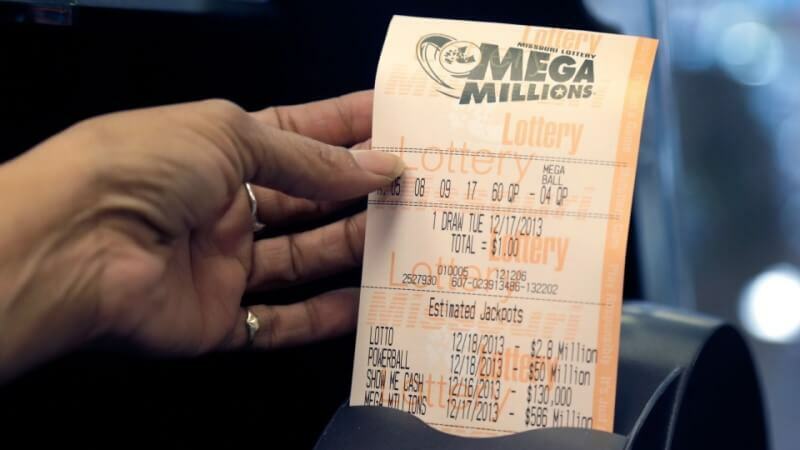 Best news of all - if you have your own lottery syndicate, or are thinking of forming one, you won't need to go through all the fuss of physically purchasing your lottery tickets each week. Instead, if you buy them through GiantLottos.com, you'll be able to order all your syndicate's lotto tickets at once, without ever needing to leave your desk. GiantLottos.com offers syndicate play on the Mega Millions, Powerball and EuroMillions lotteries - and if you're a lotto enthusiast, you'll know that these international lotteries are frequently the highest paying, and the most exciting to enter too. So what are you waiting for? 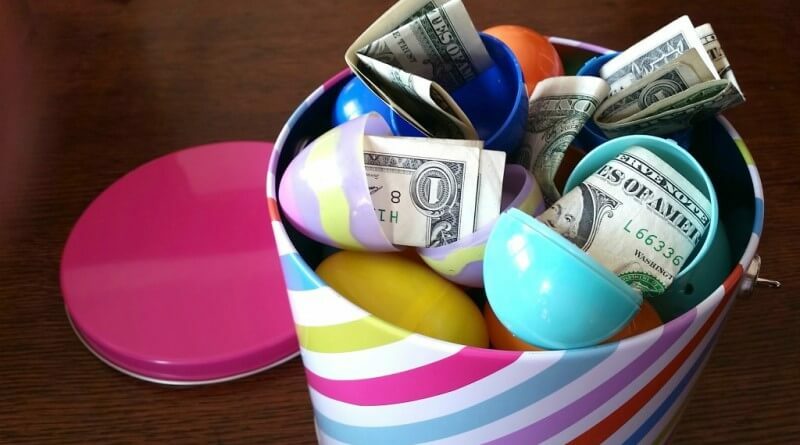 Get your syndicate together, get your lottery tickets online at GiantLottos.com, and get ready to rake in the huge lottery winnings! What Are The Most Common UK Lottery Numbers Drawn Together? Is Choosing Lotto Numbers Is For The Birds?